Before you start your day, do you look into the mirror? It’s only natural. We want to see if anything needs to be fixed in order to make us fit to be seen. The mirror does not make us presentable. The mirror does not make us ugly or beautiful. Our reflection simply shows what we look like. Once we acknowledge what we see, we set about fixing whatever needs fixing. I call this a “chive check.” You know what I’m talking about: the obligatory after-meal peek in the mirror to see if anything other than our teeth smiles back at someone. God’s word is His special mirror for us. A day started with Scripture and prayer is not a waste of time. Before we can write for Him, we need to look into His truths and see what is reflected in our hearts and our minds. Only then can we reflect Christ to others whether that be in a personal touch or in our writing. We should live each day seeking to become more and more the image of Christ. Time spent looking into God’s mirror each morning before we endeavor to write for Him brings the opportunity for God to make our hearts and minds presentable. There should never be anything other than Him reflected back at us when God’s word is our mirror. 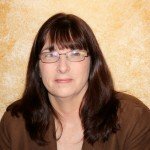 Author and editor Fay Lamb writes in Christian romance and romantic suspense. Her emotionally charged stories remind the reader that God is always in the details. 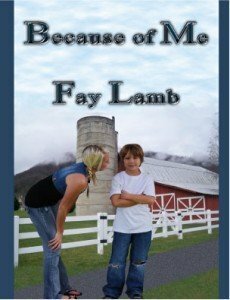 Because of Me, her debut romantic suspense novel, is soon to be released by Treble Heart Books/Mountainview Publishing. Fay and her husband, Marc, reside in Titusville, Florida, where multi-generations of their families have lived. The legacy continues with their two married sons and five grandchildren. Some young women have to go through a trial of hell on earth and their lives are never the same. Issie Putnam has a son to show for such a trial. Her fiancé, Michael Hayes, is wrongly convicted of a crime and imprisoned, adding to Issie’s heartache. As if that’s not enough, Issie’s family has distanced themselves from her, suspecting she had a role in the crime for which Michael is accused. When Michael finally returns, can he regain Issie’s trust and rebuild the love they once shared? Can he learn to love Issie’s son, a child born of vicious violence, and protect them all from the madman who seeks revenge? Phyllis: Thank you for this wonderful opportunity! Love the title. Great spiritual advice. Lord in whatever path He leads, is the greatest gift we can give ourselves!